In this guest post, Professor Sharon Collard and Sara Davies from the University of Bristol’s Personal Finance Research Centre introduce research into the experiences of people in debt who negotiate with their creditors. 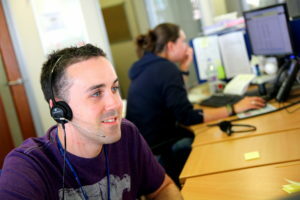 This blog post sets out some key findings from research that explored the experiences of people who face difficulties repaying what they owe, when they attempt to negotiate with their creditors after receiving professional help from National Debtline, and in a few cases, from another free-to-client debt advice service. We call these people ‘self-negotiators’ for short.  The study was funded by the Money Advice Trust and the Money Advice Service. The research comprised 27 in-depth interviews with participants from across the UK. While our participants reported a wide range of problems and situations, most of them were renters, and most of them were not in paid work at the time of the interview; or they were in and out of work, either as agency workers in lower-skilled, lower-paid jobs, or higher-paid, higher-skilled contract workers. Consumer credit debt was the most common type of debt among our participants; in some cases, however, they also had arrears on household bills such as rent, Council Tax, gas and electricity. What role does self-negotiation play in people’s efforts to sort out their debt problems? Our participants generally contacted National Debtline looking for support to self-negotiate with their creditors, with the end goal of either working out debt payment arrangements or sorting out specific debt issues. But this was by no means the first step in their efforts to try and resolve their debt problems. They had already been in contact with some or all of their creditors (some over quite a long period of time), to try and agree mutually acceptable repayment arrangements or resolve the specific debt issues. Their prior attempts at negotiation were unsupported by any professional advice service, however, and they had achieved varying degrees of success by the time they contacted National Debtline. When our participants did speak to National Debtline, they mostly expected or wanted to deal with their debt themselves – as they had already been doing. The help they wanted ranged from ‘pointers’ and ‘tools’ to work out repayment offers; information about specific topics like CCJs, liability orders, bailiffs; reassurance about their understanding of things or what they planned to do; and in some cases a sympathetic ear and a bit of moral support. What is the value of supporting people in debt to self-negotiate? Our research highlights the diversity of problem debts that people have, and that independent advice services have to deal with every day: from single priority debts with a complex back-story, to multiple consumer credit debts that build up over time. The lived experience of our participants trying to deal with problem debt themselves could be messy, time consuming and stressful. 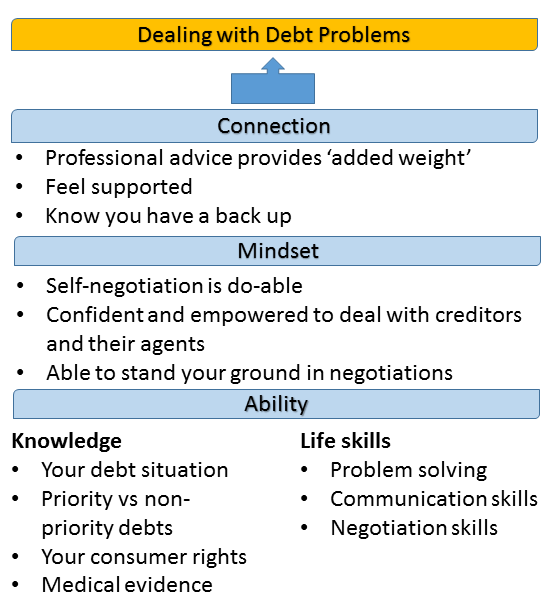 Borrowing from the Money Advice Service’s Financial Capability Model, the value of professional support from National Debtline and other advice providers was to give people the ‘connection’, ‘mindset’ and ‘ability’ to self-negotiate, summarised below. What does ‘textbook’ self-negotiation look like? In an ideal situation, ‘textbook’ self-negotiation means that people with problem debt contact their creditors, are treated fairly by them, and can agree debt repayments that are acceptable to the creditor and affordable for the person in debt, based on accurate and up-to-date information. In this ‘textbook’ situation, the intervention of a third party would be unnecessary. By definition, the self-negotiators in our study had not experienced this ‘textbook’ scenario. Even so, the interview data provides useful insight into the conditions on the side of the person in debt that shape the effectiveness of self-negotiation – whether it is supported or unsupported. From the perspective of the person in debt, three conditions stand out as important in shaping the outcome of self-negotiation: their debt portfolio, their disposable income and their motivations and capabilities. On the whole, the more debts participants owed, the more challenging it was to successfully self-negotiate, particularly where the amount of debt relative to disposable income was also an issue. As much as anything, the scale of the task facing participants was simply larger the more creditors they had, and could be overwhelming. That said, single debts owed to one creditor were not necessarily straightforward to sort out either, e.g. where participants disputed a debt or had to prove the debt was down to an error on the creditor’s part. For self-negotiation to be successful, participants had to have sufficient disposable income to offer and maintain debt repayments. This in turn depended on having reliable sources of income from work or benefits. Fluctuating incomes either from agency work or self-employment, or from switches between state benefits, were both a route into problem debt and a hurdle to self-negotiated debt management. Participants’ capabilities and motivations were also key to shaping the progress they made. Even with the right capabilities, self-negotiation won’t be effective unless the person in debt is motivated to sort out their problem debts and determined to see through negotiations with creditors. Our self-negotiators were generally motivated to seek professional support themselves when their own efforts had not been wholly successful. For participants with mental health problems, finding the personal resources to deal with creditors could be difficult at times. In these cases, professional support and the ability to deal with advice services and creditors via their preferred communication channel (often email or letter) could make all the difference. What is the legacy of professional support to self-negotiate? The positive legacies of professional support for our participants included better money management; new attitudes to consumer credit; and evidence of participants self-negotiating on their own behalf or for others. Reflecting the financial circumstances of our participants, there was little mention of positive changes to saving behaviour. The interview data shows that people in debt can’t always be the ‘perfect person in debt’ that creditors want – but that creditors and their agents can fall short in terms of their own attitudes and behaviour as well, such as flatly refusing to negotiate; charging seemingly disproportionate fees; and failing to signpost people to independent advice. Better is possible, though, as evidenced by positive creditor experiences reported by some participants. 2. What do we mean by ‘dealing with debt’? This research challenges what we mean by ‘dealing with debt’. The route out of problem debt (or at least towards more manageable debt) is not always linear or smooth. People sometimes stall in their efforts or move from one course of action to another. Progress could be incremental, piecemeal and in some cases fragile. The implications here lie mainly with advice services and the people they help, to re-balance the information asymmetries that mean that creditors and advice providers may not have the whole picture of someone’s debt situation. It might involve advice services making sure they review any arrangements that the person in debt has made themselves; or strongly encouraging them to come back for further help if their circumstances change; or proactively checking-in with self-negotiators to see how they are managing. 3. Are ‘textbook’ conditions for self-negotiation present or absent? From the perspective of a person in debt, our analysis shows three ‘textbook’ conditions for self-negotiation that can help determine whether or not supported self-negotiation is suitable: debt portfolio, disposable income, motivation and capability. There seemed to be a correlation between these three factors and the outcome of an individual’s efforts to sort out their debt, both with and without professional support. This potentially has implications for advice services (and possibly also creditors), who could incorporate these conditions more explicitly into their assessment of people who present in financial difficulty, in order to help them appropriately – for example in a pilot scheme. Our interview data shows that communication is pivotal in resolving problem debt. Get it wrong, and the process can become protracted and sometimes acrimonious. Get it right, and there is a much better chance of a sustainable arrangement. The right communication channel could also make a big difference for participants who, for example, found it difficult to speak on the phone. Good communication involves making it simple and low-cost for people in debt to get in touch (and stay in touch e.g. after debts have been sold on or when they need further advice), ideally using a communication channel that works well for them. Being able to electronically view and discuss documents with an adviser would also have benefitted some of our participants. From the creditor side, it’s important that processes for secure customer authentication are robust, while not hampering communication with people in debt. The interview data highlights how better ‘feedback loops’ could potentially benefit people in debt, advisers and creditors. At present these are largely absent – advisers don’t feed back to creditors on the outcomes of advice; people in debt don’t always feedback to advice services or creditors when their circumstances have changed or they’ve hit a problem; and advice services do not routinely check-in with the people they’ve helped to see whether they would benefit from some further advice or support. Creating better feedback loops offers a way for advice services and creditors to input learning into their systems and processes so they produce better outcomes for more people in the longer term. This article was first published in Quarterly Account’s winter 2017/18 edition issue 47.